Glenn Kafka, owner of Kafka Granite LLC, Stratford, stands among a pile of broken toilets that will be crushed and used for tile. The one-time ditch digger is today one of the largest suppliers of decorative aggregate in the nation. Some people turn their dreams into businesses. Glenn Kafka, 52, turned Kafka Granite of Stratford into a dream. Where some people only saw a rock, he found opportunity. In 1979, at age 20, Kafka bought a rubber-tired backhoe and began digging drainage ditches for area farmers. Today, he’s one of the largest suppliers of decorative aggregate in the nation. The company can match any color of precast concrete. Its exposed aggregate is used in concrete parking ramps, granite-clad buildings and skyscrapers. New York City has used a blend of Kafka’s specialty aggregates to beautify its streets and sidewalks, including Times Square. Tack & Trail, a stone mix, is used to pave hiking trails and sold to golf courses, park and recreation departments, as well as to distributors. Kafka also supplies aggregate for quartz countertops and flooring. Its product is used in baseball infields and warning tracks nationwide, including most Midwest colleges, as well as by the Minnesota Twins and New York Yankees. Ahead of its time, Kafka Granite has long produced green products that appeal to architects for LEED points they earn by using sustainable materials. One of Kafka Granite’s first customers for decorative stone aggregate was Wausau Tile. 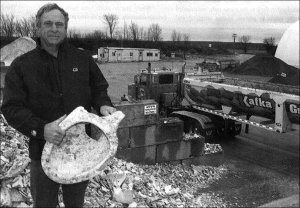 The companies later formed a joint venture with Kohler Co., recycling porcelain from reject toilets and sinks. Kafka crushes the materials and Wausau Tile uses the aggregate to manufacture terrazzo tile and other products. Kafka also is the exclusive Midwest distributor of thin stone veneer products made by Norstone, a family-owned business in Vietnam. In addition to stone products, Kafka Granite’s subsidiary, Wisconsin Salt Solutions, distributes additives that are mixed with salt to make it more effective for ice control. Kafka’s company has exclusive rights to distribute the products in Wisconsin. Kafka also manages Team LaVallee, a professional snocross team for Polaris Racing, which he co-owns with seven-time Winter X Games medallist Levi LaVallee. Kafka’s dream business began while sitting around the fire one night when a neighbor offered to sell the family granite pit. Kafka thought, “Why not?” Instead of simply digging holes, he could sell what he dug up. For two years, Kafka sold decomposed rotten granite, a popular road-building material, to towns, counties, and local contractors. Then he struck a field of huge boulders. Hiring technicians to blast through the rock, Kafka found a dazzling orange stone inside that sparkled in the sun. “I should crush that,” he said of the aggregate now called Dynamite Orange. Kafka also delivers landscape rock. And while that market is seasonal, others keep Kafka busy year-round. Kafka granite owns or leases quarries in a number of states. In Canada, rare white quartz is used in roofs made of stone and epoxy aggregates. Kafka’s 20-25 employees produce, sell, and distribute to markets throughout the Midwest. A family-owned business, Kafka’s wife, Beverly, spent her early married years in the granite pit tracking and loading trucks while her husband was on the road bidding jobs, looking for raw materials and searching for product ideas. Their 23-year-old son, Chris, retired from snocross recently to learn the business. He will eventually oversee all the outside quarries and daily production at the main plant. Daughter Tiffany, a 19-year-old student at the University of St. Thomas in St. Paul, Minn., is majoring in marketing. Eventually, she will take over the office and sales and marketing management at Kafka Granite LLC.